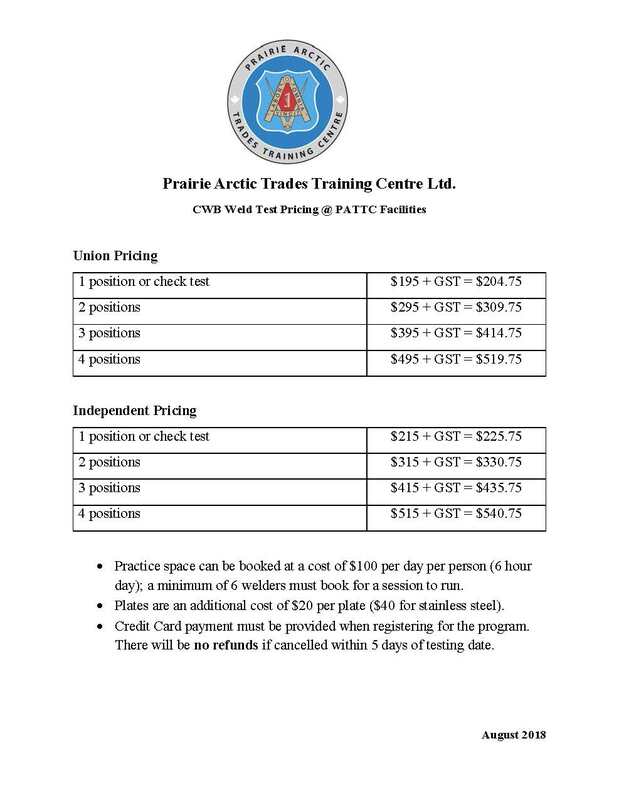 Prairie Arctic Trades Training Centre partners with First Nations and non-profit organizations, industry, trade unions and government to provide quality training in Manitoba, Saskatchewan and Alberta. We offer classes on behalf of our training partners and typically do not recruit students directly. Individuals with program inquiries should contact the partnering agency directly. Please continue to keep an eye on our website as we will provide information in regard to upcoming programs our partners are offering. Often, our clients have training needs which must be tailored to fit the circumstances. We design individualized training programs to meet the financial ability, time constraints, or content requirements. We will be pleased to discuss your requirements and outcomes with you, and provide a custom program to meet your needs. In Saskatchewan, PATTC provides the apprenticeship training for every registered apprentice. The scaffold apprenticeship program is four years long, with three weeks of training each year at either the Regina or Saskatoon facility. Apprentices who successfully complete their program and certification examinations receive provincial certification. Contact the Saskatchewan Apprenticeship and Trade Certification Commission (SATCC) for more information on becoming an apprentice, and for arranging training. In Manitoba, scaffold apprenticeship training is provided to the members of the United Brotherhood of Carpenters only. Please contact the UBC for information about joining the union and accessing training. PATTC offers a variety of pre-employment scaffold programs, to prepare you to enter the workforce. Our standard scaffold pre-employment program is 6 weeks long and is recognized for credit by the Saskatchewan Apprenticeship and Trade Certification Commission (SATCC). Content includes: Personal Protective Equipment, Site Hazards, Regulations and Industry Standards, Fire Prevention, Fall Protection, Confined Space, Scaffold Materials, Tagging System, Frame Scaffolds, Modular System Scaffolds, Tube and Clamp Scaffolds, Math for the Trades, Hand and Power Tools, Rigging Basics and Platform Materials. We can also offer custom versions of the program to meet specific needs. In any case, safety training remains the same, as safety on the job site is a critical component. PATTC offers a selection of carpenter training programs. We have a 20 week full-length pre-employment program, which is recognized for time and level 1 apprenticeship training credit by Apprenticeship Manitoba. We have a ten week pre-employment introduction to carpentry program, which is recognized for time credit by the Saskatchewan Apprenticeship and Trade Certification Commission. Additional courses include specializations in concrete forming, framing, steel stud and drywall installation, hardwood/laminate flooring installation. Our 20 week and 10 week credit carpenter courses includes Construction Site Safety, OH & S Regulations, National Building Code of Canada, Trades Mathematics, Hand and Power Tools, Blueprint Reading, Site Layout, Survey Instruments, Foundations, Concrete, Floor, Wall, Ceiling and Roof Framing, Door and Window Installation, Roof Coverings, Exterior and Interior Finishes, Energy Conservation and Building Envelope. Our introduction to basic carpentry course, which can be offered in a variety of lengths from 2 to 6 weeks, can cover versions of the following content: Fall Protection, Fire Prevention, Frame/Scaffolding, Ladder Safety, Skid Steer Training, OH & S Regulations, Trades Mathematics, Foundations and Formwork, Site Layout, and Basic Framing. Our introduction to commercial concrete course includes Construction Site Safety, Personal Protective Equipment, Site Hazards, Hand and Power Tools, Stationary Power Tools, Fire Prevention, Fall Protection, Document Use, Piles, Footings, Grade Beams Slabs, Concrete Placement and Finishing, and OH & S Regulations. Our introduction to residential framing program covers Construction Site Safety, Personal Protective Equipment, Site Hazards, Hand and Power Tools, Stationary Power Tools, Fire Prevention, Fall Protection, Document Use, Piles, Footings, Grade Beams Slabs, Concrete Placement and Finishing, and OH & S Regulations. We offer a six week Introduction to Commercial Roofing course. This program provides safety information and certifications, and introduces students to the different types of flat roof systems. The tools and equipment generally needed to complete this work are covered off as well. Our 7 week introduction to hardwood/laminate flooring includes Construction Site Safety, OH & S Regulations, National Building Code of Canada, Trades Mathematics, Flooring Materials, Hand and Power Tools, Powder Actuated Tools (Hilti Certification), Laminate Flooring Installation and Repair, Hardwood Flooring Installation and Resurfacing. We also offer an additional one week module which provides an introduction to ceramic tile installation. First Aid/CPR (2 day) - this is the Red Cross Level C which provides first aid and cardiopulmonary resuscitation (CPR) skills for those who need training due to work requirements or who want more knowledge to respond to emergencies at home. Includes the latest first aid and CPR guidelines and includes injury prevention content, CPR and AED. Forklift operator (1 day or 2 day) - trainees spend time in the classroom with video and instructor presentations on different types of equipment; then perform basic forklift operations in a practical setting. Skid Steer Operator (1 day) - trainees spend time in the classroom with video and instructor presentations on different types of equipment; then perform basic skidsteer operations in a practical setting. Fall Protection (1 day or 2 day) The one day course is a refresher which includes information from a variety of sources including the Saskatchewan or Manitoba OH&S regulations, and videos from fall protection manufacturers. There will also be demonstration and use of various harnesses, lanyards, anchorage devices and lifeline systems. Dealing with suspension trauma is also addressed and explained. The two day course is the full program required for new workers, and goes into greater depth on all subjects to meet more stringent employer requirements. Both courses include practical applications. Confined Space (1 day and 2 day full program) - curriculum addresses safety requirements when working at sites that may contain confined spaces. It covers types of confined spaces, characteristics of confined spaces, hazards on industrial, and commercial sites. It includes permit required confined spaces, Atmospheric hazards, air monitoring, ventilation, Isolation and lock out, communication and rescue as well as addressing the Saskatchewan or Manitoba OH&S regulations for Confined Space. This course uses a variety of resource information, including the Saskatchewan or Manitoba OH&S regulations, and various videos. There will also be demonstration and use of air monitors, Supplied air breathing apparatus, self contained breathing apparatus, various half and full face respirators, air filtering, air supplied respirators and fit testing. Students must demonstrate proper use and care of the above equipment in an uncontaminated atmosphere. Rigging and Signalling (2 day or 5 day) - this course introduces rigging, with an emphasis on materials and components, and safe practices. Various types of slings and hardware. load weights, centre of gravity and configurations are discussed and demonstrated. Additionally, trainees learn standard signals as well as overhead crane-specific signals. PATTC offers a 6 week basic welding and cutting program, which includes: Safety training, Hand and power tools, Welding equipment, Oxyfuel cutting/welding, Plasma arc cutting, SMAW (stick) welding, GMAW (MIG) welding, Overview of TIG and Flux core welding, Basic weld symbols. This program typically uses an additional two week work placement, arranged by the client, to provide additional training and expertise once the in-school portion is completed. 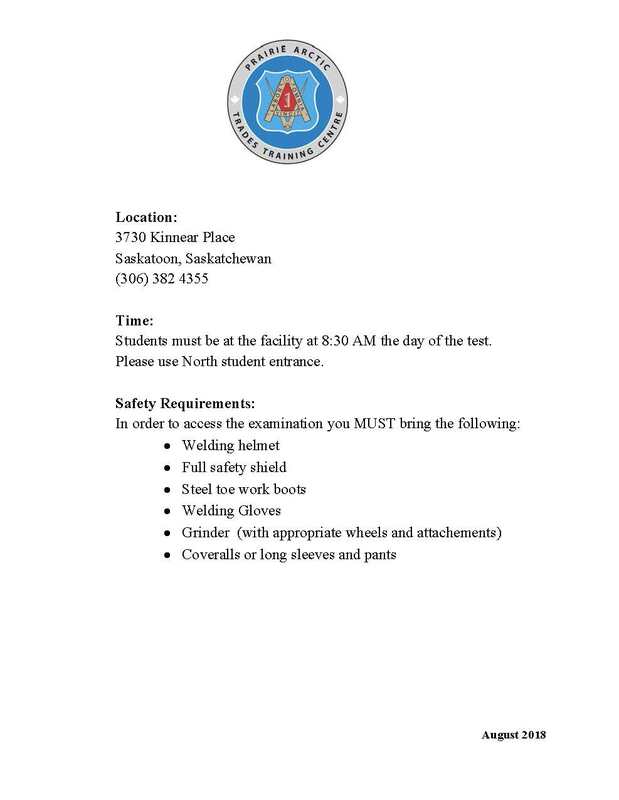 Our Saskatoon and Winnipeg training centres are CWB testing centres. PATTC offers a 2, 3 or 4 week course for "Asbestos Awareness". The program provides learners with the basic fundamental knowledge and practical skills for asbestos controls. This program includes the following: OH & S Regulations, Asbestos Legislation and Guidelines, Construction Site Safety, Personal Protective Equipment, Respiratory Protection Fit testing, Fire Prevention, Asbestos Materials, Asbestos Controls. PATTC offers a 4 week "Introduction to Steel Stud and Drywall" course. The program provides learners with the basic fundamental knowledge and practical skills for steel stud framing and drywall installation. The program can also be split into a two week steel stud program, and a two week drywall application and finishing program, to meet client needs. This program includes Personal Protective Equipment, Fire Prevention, OH & S Regulations and Industry Standards, Site Hazards, Metal Framing Techniques, Drywall Applications, Drywall Finishing. 3 day ICRA certification – this program is offered to carpenters who undertake the construction and renovation of health care facilities, including hospitals, nursing homes and special care locations. 1 day ICRA awareness program – everyone working at a health care facility should take this awareness program, so they can understand the risks involved and the means by which they can be controlled. Health care workers, other trades at the sites and maintenance staff all will benefit and enhance patient and medical staff safety and health. Millwrights work in a large variety of industries, including mining, power generation and manufacturing. Training for the Millwright (Industrial Mechanic) trade is provided by PATTC either onsite or at one of our training facilities. The program is 8 weeks in duration and introduces students to the basics of the trade. Upon completion, the students will have learned new skills, understand the work of the Millwright trade and be better prepared to join the skilled workforce. The course includes instruction on the installation and repair of industrial equipment, workplace safety and relevant OH&S requirements. Graduates will also receive the safety certifications needed to be employed in industry.